Ride and Read! NEWS by Madness Photography - Onno "Berserk" Wieringa: Insane Evel Knievel Jump Attempt at the Buffalo Chip! Insane Evel Knievel Jump Attempt at the Buffalo Chip! Sept. 1, 1972 – Evel Knievel® attempts 22-car world-record jump on 1972 Harley-Davidson XR-750…FAILS! July 4, 2001 – 22-car jump attempted again…motorcycle daredevil ALMOST DIES! Aug. 6, 2015 – Evel’s® 22-car jump attempted once more...IS THIS A SUICIDE ATTEMPT?! Time will stand still on Thursday, Aug, 6, 2015, as you wait to witness an impossible triumph or an unspeakable tragedy. Your heart will race, and you’ll clench your teeth, but nothing will be able to pull your gaze from an attempt at the insane motorcycle stunt the great Evel Knievel was never able to pull off—a 22-car jump on Evel’s own vintage 1972 Harley-Davidson XR-750. Odds were stacked against Knievel® when he attempted this world-record jump in 1972. His crew warned the bike would be unable to reach the speed it needed to clear the distance, and they were right. Knievel failed with a bounce landing on the safety ramp the crew built over the lineup’s final three cars. When another motorcycle daredevil attempted this jump in 2001, the world watched in horror as he missed the landing and was violently thrust end over end until his head nearly came off. He spent 3 months in a coma, and the jump nearly cost him his life. 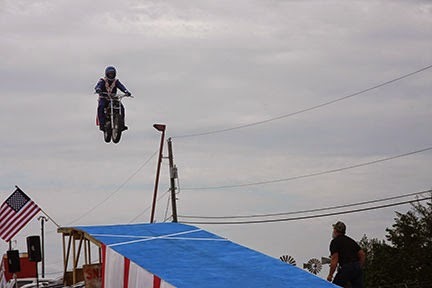 This August, you can see what happens when motorcycle daredevil Doug Danger tempts fate by attempting this exact jump in the Buffalo Chip amphitheater, using the very same bike that failed Knievel and ultimately lead to his defeat. There’s no telling what will happen during the Buffalo Chip’s Evel Knievel Thrill Show, but one thing is for sure…the outcome will forever change motorcycle stunt history! Is this jump a suicide attempt? There’s only one way you can find out, and that’s to make sure you’ve got a Buffalo Chip campground admission pass! The Evel Knievel Thrill Show Jump is included for free with your Thursday, Rally, Extended Rally and Early Bird Campground Admission Passes. Prices are the lowest they will ever be now, so don’t wait and be the only person to miss this spectacular jump in the Buffalo Chip Amphitheater. 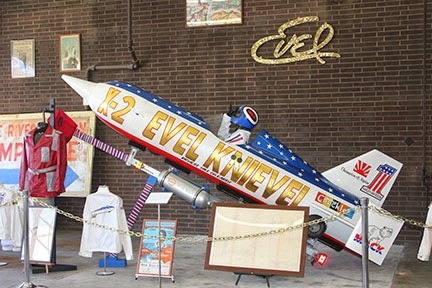 In addition to this potentially deadly world-record jump attempt, for only 10 bucks more you can get the full Evel Knievel experience and come face to face with the world’s largest collection of Knievel curiosities July 31 – Aug. 8 at the Buffalo Chip CrossRoads. 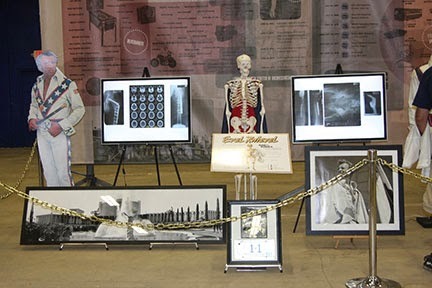 Get an up-close look at X-rays of Knievel's broken bones, his X-2 skycycle rocket, the Mack truck show rig he named “Big Red,” his iconic “Sports Illustrated” leathers and cape, and much more. We didn’t exhume Evel Knievel himself, but you’ll be able to experience everything else! Don’t be the one to miss out on the full Evel Knievel experience at the Buffalo Chip!